“Like a good neighbor, State Farm is there. You’re in good hands with Allstate. Saving people money for over 75 years (GEICO). Think easier; think Progressive. Nationwide is on your side.” You’ve heard all of these slogans thousands of times and seen the warm and fuzzy ads on TV too many times. I can tell you from personal experience owning and operating body shops for 46 years, insurance companies are not like good neighbors. Insurance companies are the most profitable companies on Earth, but you can’t always tell that by their tax returns or financial statements. Insurance companies are sheltered from paying taxes like other corporations must do because they can, and are required, to “reserve” large amounts of cash contingent to paying claims. Then they take those huge hoards of cash and wisely invest them in stocks, bonds, real estate, etc. so that they can grow those cash reserves. When you pay a monthly premium to your car insurance company, they don’t pay any income tax on that. They invest it and grow that premium, compounding it over the years. Only after years of accumulating your premiums and growing that cash through investments do insurance companies begin to pay income taxes. This continuous, compounding tax deferral is how Warren Buffet made the bulk of his vast fortune. How did insurance companies come to win this great tax advantage over all other corporations? They can afford to pay the best and most powerful lobbyist, in Washington D.C. and all fifty states. When a big insurance company says “jump” our elected officials say “how high”. For a politician to vote against a bill that Big Insurance wants is political suicide. I have nothing against profit and I applaud those companies that make large profits. Under our capitalist system and the free market place, those companies that can provide the best products and services and satisfy the customers the best should prosper. I have a problem with companies that make their large profits by distorting the tax code to favor their companies over others and that earn greater profits by exploiting their customers and associates. Collision insurance companies pay body shops less than $50 per hour to repair your car after it has been damaged in a collision. Car manufacturers pay mechanical service departments over $100 to fix your car when it has a mechanical problem, more than twice what insurance pays for body repair. Mechanical and body repair technicians are typically paid a commission based on the amount of labor they perform. This commission is a percentage of what the insurance company or manufacturer pays the service department or body shop. It follows that body repair technicians earn far less than their mechanical technical counterparts. Now, here’s the rub! Body repair technicians are at least as well trained and skilled as mechanical repair techs. In fact, there is a greater shortage of good body repair techs than mechanical. One would think that the laws of supply and demand would command a higher wage for body repair techs, or at least the same as mechanical techs. But they make much less. This is where you come into the picture. Let’s say your car has been in a bad accident incurring thousands of dollars in damages. You want it repaired right, not just so it looks as good as it did before, but, more importantly, so it’s as safe as it was before. You want to be sure that the technician who repairs your car knows and cares what he’s doing! You’ve heard the expression, “You get what you pay for.” This means that if you hire a plumber to fix your clogged sink because he agreed to charge you half the hourly rate of what all the other plumbers were charging, it’s likely that the problem wasn’t corrected the it should have been. The reason that body repair technicians are paid so little is because the insurance companies mandate it. About 95% of all auto repair work is paid for by insurance. Insurance companies largely control which body shops repair the vehicle of the insured. Each insurance company has a list of “preferred body shops”. If body shops are not on the preferred lists of any insurance companies, it’s very likely that they won’t be able to remain in business. One of the requirements to be on that list is to charge the insurance company what they say you can charge. The insurance companies claim to arrive at these hourly rates by market studies, but the studies are bogus and rigged to come up with an hourly rate far below what it should be. The body shops and the insurance companies know that it’s impossible to repair cars safely and properly at the hourly rate they pay so they “do what they have to do” to get around that rate. The insurance companies force the body shops to use cheap after-market or used parts when new original manufacturer’s parts should be used. Insurance companies also “look the other way” when body shops repair or straighten a metal part that should have been replaced, but cost more. Most of the damage that’s done to a car in a collision is below the surface and invisible after the repair is completed. This means that all visible evidence of substandard and unsafe repairs is hidden. The customer comes in to pick up her car and it “looks great”. She may never how many short cuts were taken so that the car could be repaired for what the insurance company was willing to pay. My advice to you if you have a car in need of body repair is be sure that you choose the body shop, not your insurance company. Check out this body shop carefully, just like you’d check out a doctor or dentist for yourself or a family member. Ask for referrals, check with the BBB, and the County Office of Consumer Affairs. Google the company and check out their online ratings. Your insurance companies will try hard to persuade you to use their “preferred shop”. They will tell you that they won’t guarantee the repair unless you take it here. If you pick a good body shop, that shop will give you as good, or better, guarantee on their work than the insurance company. Be sure that the body shop you choose is on your side and not the insurance company’s. Explain that you want new parts, not used, rebuilt, or after-market. If the insurance company objects, stand shoulder to shoulder with your body shop and demand that the repair be done properly and safely. If the insurance company still gives you a hard time, tell them that you will take them to court and they will usually back down. Some body shops will do this for you, but you have to assign your rights to litigate on your behalf to that body shop. If this sounds like too much trouble, it’s not as bad as it sounds. 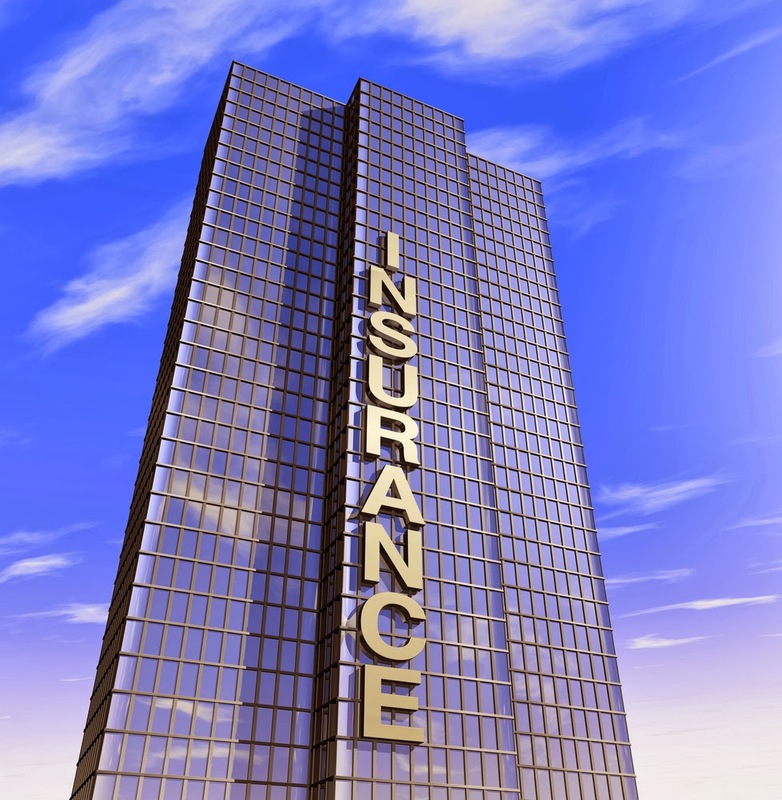 Insurance companies know that they are doing the wrong thing and they don’t like to go to court or attract attention. You will be surprised how often people like you who have the courage to stand up to Big Insurance will find them backing down. Some of my regular readers will recall that I testified before the Florida Senate Commerce Committee a few years ago. My purpose was to introduce legislation to make the dealer fee illegal in Florida. The bill never got out of the senate committee because it was “shot down” by the Florida Automobile Dealers Association, FADA, which is referred to as and pronounced fah-dah. For those who don’t already know, FADA is a powerful lobby for the car dealers. They have a lot of money because car dealers make a lot of money and can donate a lot of money to their political action committees, PAC’s. In full disclosure, I have donated to FADA political action committees in the past and continue to do so. That’s because they protect car dealers against harmful action by the auto manufacturers, but I abhor the way FADA protects car dealers that advertise and sell cars in deceptive, unethical, and even illegal ways. A big reason that I was defeated in that effort was that the attorneys at the hearing representing the Florida Attorney General (AG) told the panel of senators that they received relatively few complaints on car dealers charging dealer fees. In fact, they received many more complaints on other businesses like storm shutter installers and paving contractors. The AG lawyers said they had to focus their limited resources on those businesses that had the most number of complaints. Of course, the lawyers from FADA completely concurred with that excuse. Hence, I’m writing this article on “How to file a car dealer complaint with the Florida Attorney General”. There’s no question in my mind that most car owners in south Florida have a “beef” with a car dealer that they bought, leased, or serviced their car with. In fact, it’s not just south Florida, it’s the entire country. The Gallup organization conducts a national poll every year asking us which businesses we consider the most honest and ethical. Car dealers finish last almost every year (Congressmen are usually next to last). I’m not sure why more victims of car dealers don’t file complaints with the regulatory agencies. I do know why car dealers do not receive as much negative publicity as they deserve and that’s because the local media is afraid of them. Car dealers are the largest local advertisers and they spend a huge amount of money on advertising that newspapers and TV and radio stations rely on. You may know that car dealers banded together to force Seaview Radio (WSVU in North Palm Beach) to cancel my consumer advocate show, Earl Stewart on Cars, which had been on the air for 7 years. They told the owners and management of Seaview that they would not advertise unless my show was canceled. Perhaps it’s the lack of reporting by our local media on how car dealers deceive car buyers with their advertising and sales practices that makes for so few complaints being filed. If everyone who reads this column/blog who has been wronged by a car dealer will take the time to file a complaint with the Florida Attorney General’s office, I’m confident that we will see some immediate action. Because of my role as an advocate for car buyers, I hear from dozens of victims of car dealers every month. If those same people would also file a complaint, car dealers would rise on the priority list of companies that are ripping of Florida consumers so that the AG would be able to allocate their limited resources to control and curtail unethical, deceptive, and illegal advertising and sales practices by car dealers. Please click on this link, www.FileAComplaintFloridaAttorneyGeneral.com and file a complaint. You may also call the Office of Citizen Services at 850 414-3990 or the Fraud Hotline at 866 966-7226. I know you’ve complained to your friends and neighbors and maybe even to me. But now it’s time to complain to somebody who can stop these car dealers from taking advantage of you. I’ve written many articles about the infamous “Dealer Fee”. There’s another very common trick that most dealers use that is equally prevalent, deceptive and called “dealer installed options”. Dealer installed options are products that have very low cost and value that have huge markups. Typically they are preinstalled on all of the dealer’s cars in inventory, with the exception of a few “ad cars”. These ad cars are ordered in small quantities, stripped of factory accessories and often without even an automatic transmission. They are typically ordered in the least desirable color and trim. The advertised car also either pays no commission to the salesman or a very small one. Typically only one car is available and when you ask to see it, the salesman will tell you that it’s been sold. The advertisement will sometimes say, “Many cars are available at similar prices” or words to the effect that there is more than one, but they are all priced higher than the one car advertised. The dealers will put a stock number in the fine print. This is the stock number of the advertised car and is the dealer’s defense for having only one car (which was just sold) at that low price. Even if you are able to read the fine print, seeing something like “#6339A” is not something that would give anyone a clue that this means there’s only one car available at this price. I recently sent a mystery shopper in to investigate an advertisement by a South Florida dealer who was advertising a new 2014 Toyota Corolla for $14,988. The shopper was told by the salesman that this offer was for only one Corolla and it was a stick shift. When she asked to see the car, the salesman said the car was “unavailable”. Then the salesman explained that all of their other Corollas had an additional charge of $897. This was for “dealer installed options” consisting of pin stripes ($199), floor mats $299), and nitrogen in the tires ($399). The dealer’s approximate cost for these items is about $100, about a 900% markup! There was also a charge of $24.99 for an “electronic filing fee” and $75 for a “Tag Agency Fee”. These sound like state fees but they are not, only costs from subletting to outside private companies being passed along to the car buyer for more profit to the dealer. The bottom line is that the car advertised for $14,988 really cost $15,985, almost a thousand dollars more! What I’ve described above is the rule, not the exception, with most South Florida car dealers. The only way to avoid this sort of thing is to insist on a bottom line price. The only charge you should pay in addition to an advertised or quoted price is state sales tax and fees for the license tag and registration. You can check with the Florida Department of Motor Vehicles to confirm what a tag and registration costs. Costs the dealer may claim he incurs for obtaining these like “electronic filing fee” and “tag agency fee” are bogus charges which simply reimburse the dealer for his normal operating expenses. When you pay a dealer for his expenses, you are paying him a higher price and profit on the car. The law requires that this be disclosed as a dealer fee and included in all advertised prices. As far as “dealer installed options” go, the safest bet is just don’t buy them. Make it clear from the beginning that you insist that all options or accessories be factory installed. If a dealer won’t agree to this, don’t buy a car from him. If there is an option the factory doesn’t offer that you want to buy, be extra careful to compare prices on that option with others who offer the same thing. The only reason dealers install options on cars is because they can mark them up exorbitantly as in the “900%” example above. Also, remember that dealer-installed options are not warranted by the manufacturer of the car and their quality is not as high. By getting at least three out-the-door prices on the exact same year, make, model car you want with identical MSRP’s you are assured of getting a good price. Don’t be fooled by “dealer list” which many dealers quote you to make you think it’s the manufacturer’s suggested retail price, MSRP. Also, do the same thing with getting the best price on your trade-in and the best rate on your financing. Shop your trade-in just like you want to sell it without buying another car. Be sure you check interest rates with your bank or credit union and another bank just be sure. Consumer Reports (CR) is considered to be the journalistic icon of consumers’ rights in America. I have written columns for this blog and Hometown News. I’ve advocated on my radio show for Consumer Reports. I considered them the single most reliable source for consumers selecting the best products and sellers of those products, and I still do. Since 1936 Consumer Reports has set the example for unbiased, scientific evaluations and opinions on virtually every product Americans buy. They report, not only on products and services, but those who sell those products and services. They accept no advertising or any other consideration from companies. In fact, they will not even allow a company to use their name if they have endorsed a product of that company. When Consumer Reports recommends a product, you can be sure that it is their honest belief that that the product is a good one. Everyone is entitled to one honest mistake and I have to believe that this was the case with Consumer Reports. Consumer Reports offers an auto-buying service to its members and charges $12 to give their members “Consumer Reports bottom line price” to buy any new car. They sublet this to an outside car buying service, TrueCar, which provides this data. In fact, TrueCar provides this service directly to car buyers for no charge at www.TrueCar.com, whereas CR chargers $12 for each car you want to get the “best” price on. In full disclosure, I’m a member of TrueCar’s national dealer council. I’ve written about TrueCar in Hometown News and my blog, highly recommending them, just as I have Consumer Reports. TrueCar, as a result of my advising and urging, will be moving soon to require all car dealer members of the TrueCar program to more clearly disclose the “true”, bottom line price. Consumer Reports is inadvertently leading their members who purchase what they believe to be the “bottom line price” a price which is actually much higher than the bottom line. In the example above, the “estimated dealer price” of $22,253 with “estimated savings: $4,782” on a new 2014 Toyota Prius, is actually $23, 252, almost one-thousand dollar higher! The estimated savings are only $3,783, not $4782. 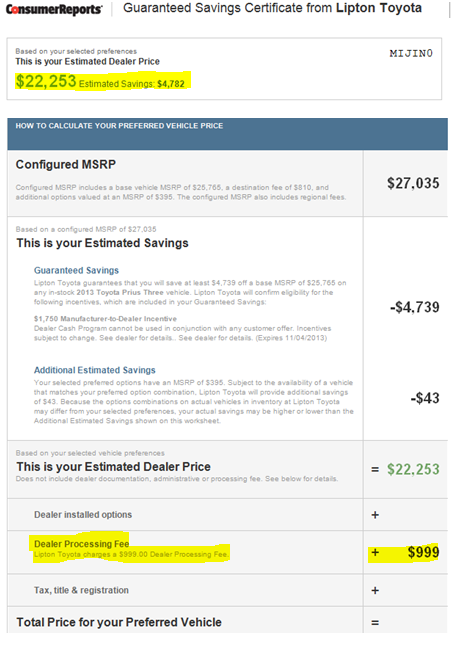 The extra $999 that the dealer adds to the bottom line price is disclosed in the pricing that CR gives their members, but it’s disclosed in the fine print and below the focal point of their documentation which states, “This is your Estimated Dealer Price” and the price is featured in bold print and color. Some might say that as long as the extra dealer profit not included in the “bottom line” price is disclosed in the fine print, CR’s done nothing wrong. First of all, this is not the way Consumer Reports does business. CR is vehement against fine print ads that trick buyers. This issue was actually brought to my attention by a very well educated, intelligent consumer who was tricked by this very CR “bottom line” price. She brought it to the attention of her mother (who happened to be my wife) because she thought my price (I’m a Toyota dealer) was higher than the other two dealers’ prices. If an intelligent woman that is a college graduate, and investment banker can be duped by Consumer Reports’ “bottom line price, what chance has the average consumer? Florida law requires that that dealer fees aka “Dealer Processing Fees” and many other names be included in the advertised price of the vehicle. I’m not a lawyer, but I think a good argument could be made that this information emailed to a prospective car buyer could be construed to be an advertisement. This particular dealer adds $999 to the Consumer Reports’ “bottom line price”, but he could add as much as he likes. In fact, Florida law has no cap on the amount of fees (by names limited only by the imagination of car dealers) that dealers can add to their quoted prices. The phrase, dealer fee, is used only for convenience; other fee names commonly used are dealer prep, pre delivery inspection, tag agency, electronic filing, administrative, doc., documentary, notary and closing, etc. If a dealer thought he could get away with hit, he could charge a million dollar dealer fee and Florida would deem that legal! Florida requires that the dealer disclose on the invoice the following: “This charge represents costs and profit to the dealer for items such as inspecting, cleaning, and adjusting vehicles, and preparing documents related to the sale”. The truth be known, added cost to the price of a product is defined as “profit” so the disclosure should simply read this charge represents profit to the dealer, period. I know that Consumer Reports is not aware of any of this and hopefully they will read this blog or Hometown News column and realize that they are inadvertently aiding and abetting dealers in unfair and deceptive advertising and sales practices. If you are a subscriber/member of Consumer Reports or have used their auto-buying service, please consider calling and or emailing them on this subject. Maybe you should send them a copy of this column.